Bonsenkitchen TR8701 toaster is a brilliant kitchen assistant to make your home breakfast and office afternoon tea easier. 2-slice and compact design is space-saving and perfect for your kitchen. 7 shade selection settings from the lightest stage 1 to darkest stage 7 and defrost, reheat, cancel function with red indication lights meet your variable toasting demands. 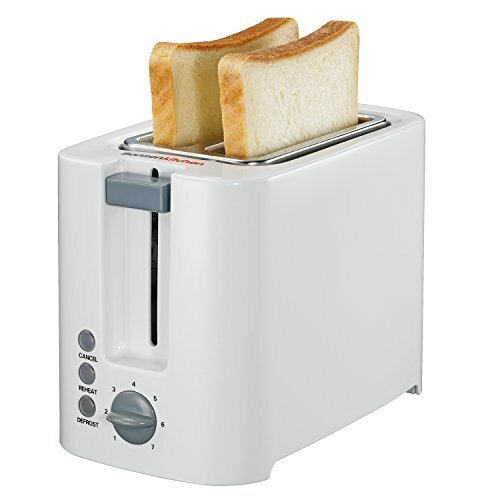 The toaster will switch off immediately once the toasting setting has been reached, then the toasted bread will be popped up automatically for safe reach. With a sliding crumb tray, it is easy to clean up the toaster once toasting is finished and the machine has been cool down. Reheat: this toaster can just reheat bread if needed. 1. Replace the bread into the toaster. 2. Set the browning control to the lowest setting, and press the reheat button. 3. Press the lift lever down to position the bread. 4. The lift lever will pop up automatically when reheating is finished. Defrost: this toaster can defrost frozen bread before toasting if needed. 1. Place the bread in the toaster. 2. Set the browning control to the desired setting. 3. Press the lift lever down. 4. Press the defrost button, the indicator will light up. 5. The lift lever will pop up automatically when reheating is finished. Cancel: press the CANCEL button to stop toasting if the bread is nearly burnt. This button can be pressed at any time if necessary. COMPACT & CONVENIENT - 2-slice compact toaster with normal width slots (1.26 inches) is space-saving and perfect for your kitchen with a free kitchen timer, cool touch housing makes toasting safely. MULTI-FUNCTION CONTROLS - 7 adjustable browning settings for variable toasting color selection, defrost, reheat and cancel function with red indication lights meet your variable toasting demands. HANDY LIFT LEVER - once the toast is finished, the bread will be popped up automatically for safe reach. EASY CLEANUP - sliding crumb tray at the back of the machine is easy for cleaning up the toaster when finish toasting. CORD STORAGE - the cord can be stored when finish using the toaster by twining it around the small slots on the bottom of the machine to make your countertop tidy.